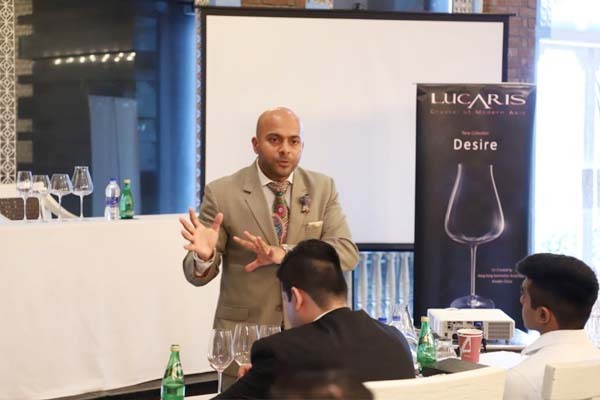 Lucaris – The Crystal of Modern Asia, in association with India’s first French-qualified sommelier, Magandeep Singh conducted a Masterclass at the Sofitel, Mumbai. The award-winning writer and TV show host with ardent knowledge of wine tasting led the Masterclass for most competitive sommeliers who hailed from different hospitality industry and institutions from Mumbai and Pune. The evening began with Magandeep giving an insight on the different kinds of glasses from Lucaris’s Desire Collection. On display were four of the crystal glasses, Robust Red, Elegant Red, Crisp White, Rich White. With the use of these, he brought to light, how wine when served in different types of glasses, in regard to their shapes enhances the taste and texture.